Cecile and I have been friends for just over 20 years. She grew up in southern France and we met when she stayed with my family through an exchange student program when we were teenagers. The following year, my brother and I saved our summer job money and spent a couple of weeks exploring France with her family hosting us. It happened to be the same summer that France was hosting the World Cup and while we didn't have the funds to attend any games, we got to watch from bars and public venues as France made their way through the quarter and semifinals and eventually won the World Cup. It was an amazing trip, and one I still have very fond memories of. Cecile went on to attend college in the United States and fell in love with Francis; an expat from Uganda. 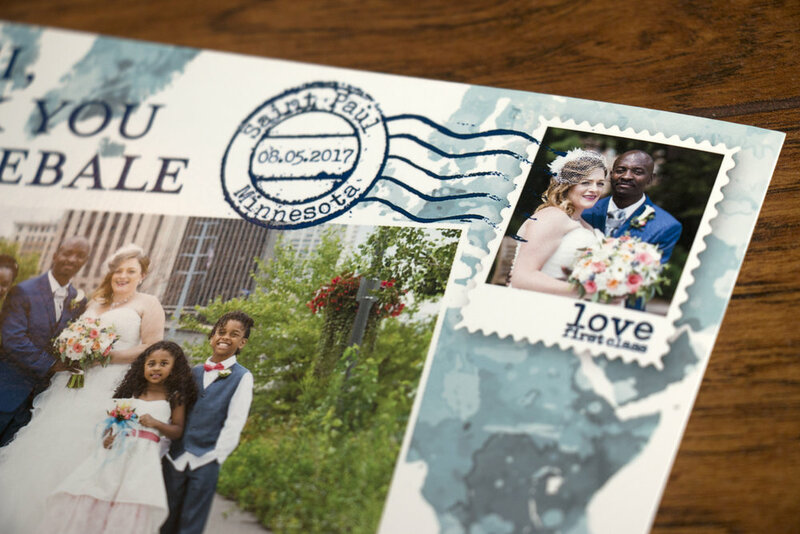 They settled in Minneapolis with their kids and this past summer, I was honored to work with both of them on the printed items for their long-awaited wedding. 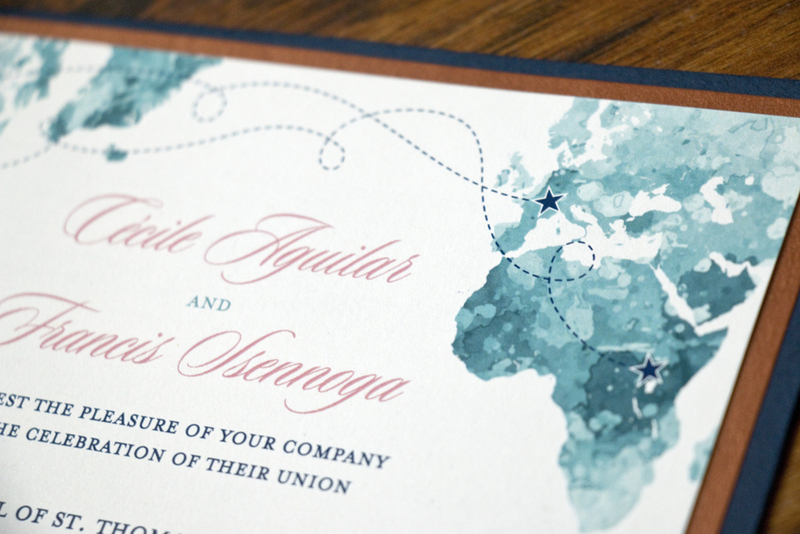 Their wedding invitation paid homage to their backgrounds with a world map marking Uganda, France, and their home in Minnesota using their wedding colors in teal, navy blue, coral, and copper. I absolutely LOVE how this turned out. 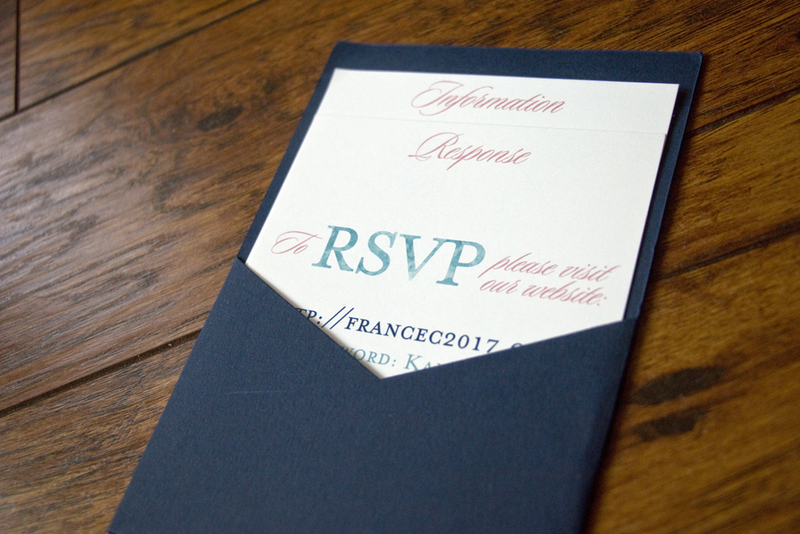 They went with Panel Pockets from Cards and Pockets in Imperial Blue with matching envelopes. These are an awesome solution for wedding inserts if you don't want the pomp and circumstance of a traditional pocketfold. The 5x7 panel simply has a pocket on the back for any inserts. The two inserts included R.S.V.P. information along with maps and directions to each of the two venues. 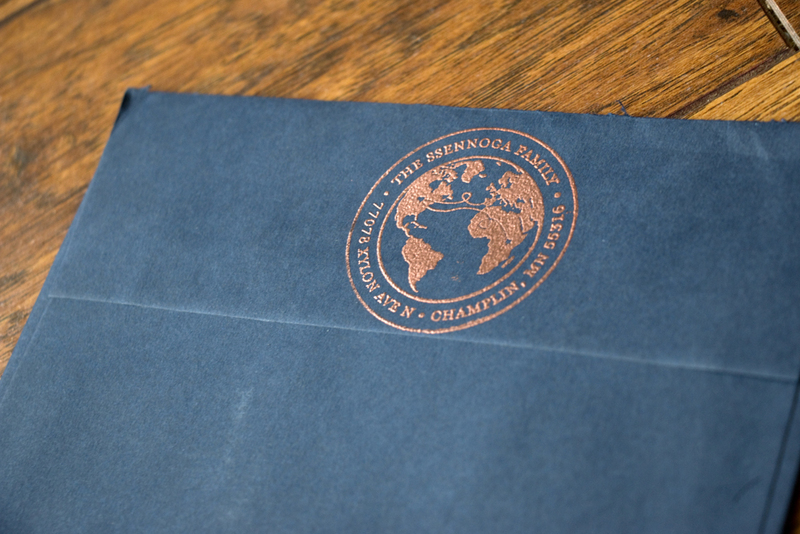 A fun detail that I have been doing more and more for clients is a custom return address stamp. I created what we later named their "family logo" and had it made into a 2" rubber stamp with Hello World Stamps. Don't stress, the magic of Photoshop allowed me to change their home address. Kelly with Hello World Stamps is amazing to work with and HIGHLY recommended. Cecile went so far as to emboss the stamps for all 200 envelopes that were mailed out. They look wonderful with the metallic copper finish! My oldest son and I had the privilege of attending Cecile and Francis' wedding this past August. My son is eight and had never attended a Catholic wedding ceremony before. He was confused about why we kept standing up and sitting down, and why he couldn't use the rail for kneeling as a foot rest. But he made it through and had fun dancing with new friends he made at the reception, including Cecile's oldest son. When guests arrived to the reception there was a red carpet and this step and repeat backdrop that Francis had printed with their "logo" and their wedding hashtag. It was so fun to take photos! 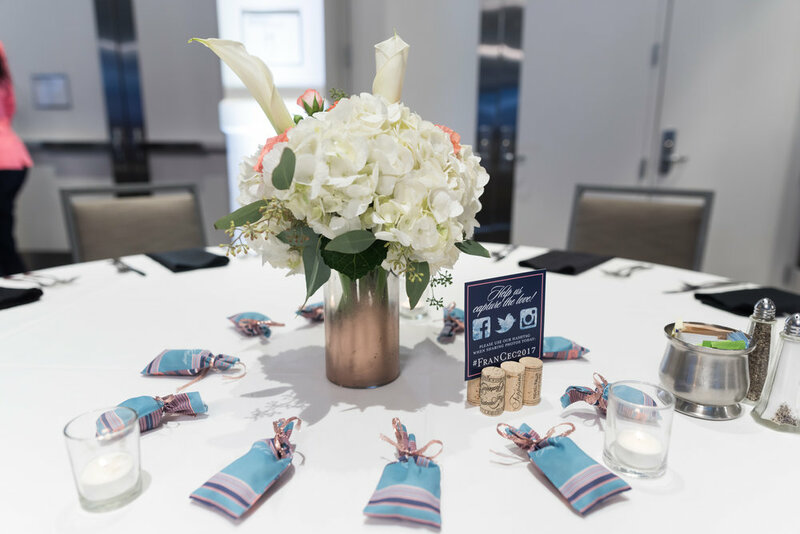 For wedding favors, Cecile was originally planning to use traditional Ugandan kikoy fabric and sew it into small bags to hold Jordan almonds. But the fabric connection fell through. Then I suggested we create our own kikoy print and have fabric custom printed. She sent me a few photos of different kikoy stripes and I created one that used their wedding colors. Cecile ordered the fabric from SpoonFlower and it tuned out really beautiful! In this process, I also learned that Jordan almonds are originally from France! I will try and find my favor and take a closeup photo. There were also a handful of Reserved signs for family. These little signs were scattered throughout the reception too, reminding guests to share photos with their wedding hashtag. They printed this giant map in lieu of a traditional guest book. Everyone was encouraged to sign with well wishes and love. It will look wonderful in their home with messages from their guests! Finally, a few weeks after the big day, we created this thank you card that they sent out to guests. 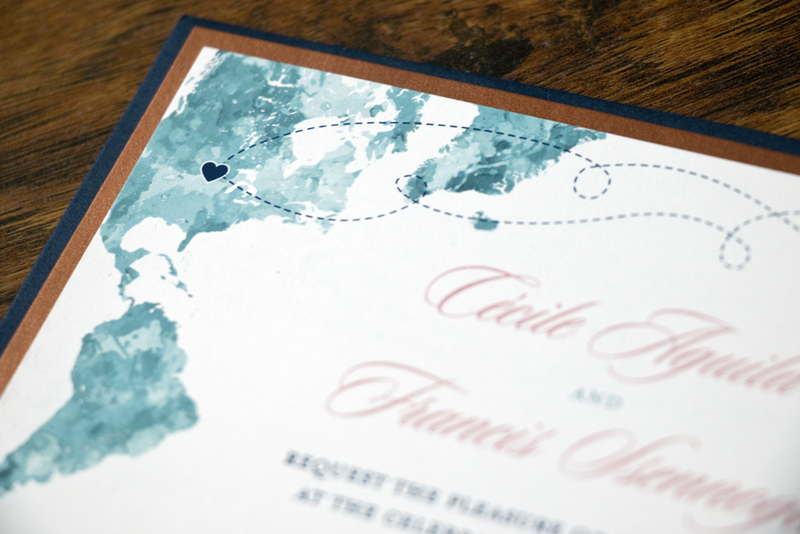 We continued the travel theme with the map and turned it into a mock postcard with two of their wedding photos. I really love how this turned out. The back was left with empty space so they could handwrite a thank you message. 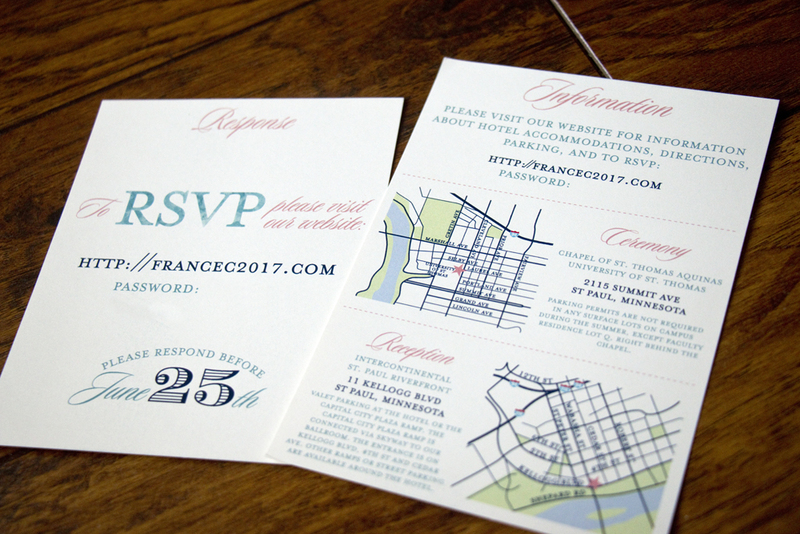 Cecile and Francis, thank you so much for thinking of me when it was time to create beautiful printed items for your wedding. It was truly an honor to get to play a tiny part in your big day and to actually be there too was just the icing on the cake! Congratulations and I wish you many, many years of joy. XOXO!